Corns are often used in both Chinese or Western cooking. They are sweet and nutritious, loaded with dietary fibre and enriched with vitamin B, good for eyes. It even may help lower blood pressure and cholesterol. 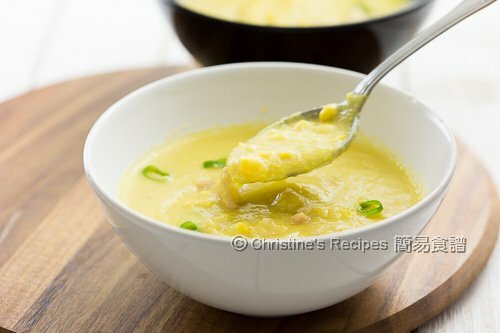 Previously I posted a corn soup recipe using canned creamed corns, it’s handy, quick and delicious. It’s a keeper for any hectic days or when I don’t feel like cooking too long in the kitchen. Fresh sweet corns are often on sale at my nearby supermarkets. I would feel it’s a shame if not getting some back home. 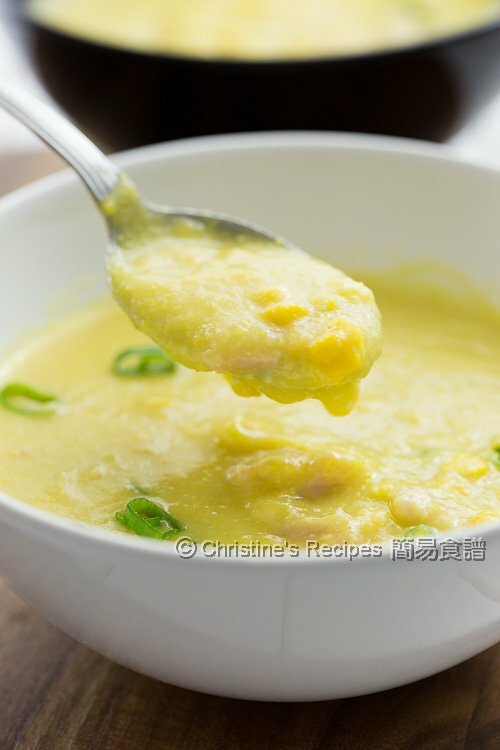 To use fresh corns to make soup is not that troublesome as I thought. I opted to decrease the amount of cream used and added a potato to create a creamy texture. If you are into a smooth texture as I do, you may sift the soup mixture after blending it with a food processor. But it’s not necessary after all. The taste is wonderfully tasty. 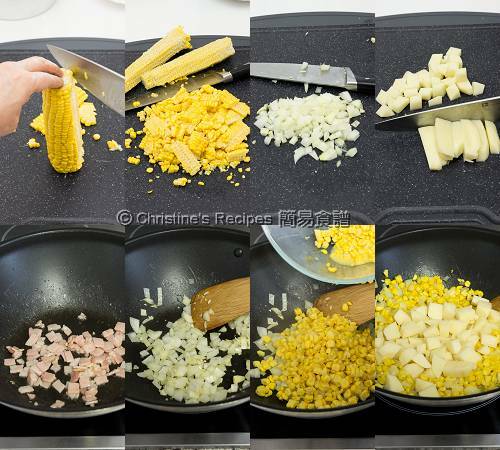 Use a knife to slice off the corn kernels. Separate those kernels that stick together with your hands. Peel and dice the potato. Set aside. Use a large pot to heat oil over medium heat. Cook the bacon until its oil is released. Transfer on kitchen paper to absorb excess oil. In the same pot, sauté onion and garlic. Don’t let them get burnt. Otherwise the soup will taste bitter. 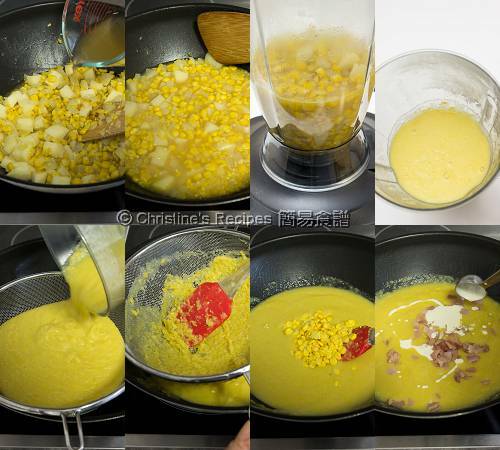 Add in the corn kernels, reserving 3 to 4 tablespoons for later use to create a crunchy texture if desired. Stir fry about 3 minutes, until aromatic. Add the potato. Pour in the chicken stock. Bring it to a boil with cover. Continue to cook for another 15 minutes, or until the potato is softened. Remove from heat. Let it cool down a bit. Carefully transfer to a food processor and process until smooth. Drain through a sieve. Pour into the pot and cook over medium-high heat. Add in the reserved kernels. Cook for 5 minutes. Stir in the bacon. Season with salt, pepper and cayenne pepper. Garnish with diced spring onion. Serve hot. Corn kernels are cooked very quickly. After processing with a food processor, drain through a sieve if you want it very smooth. You may skip this step though. 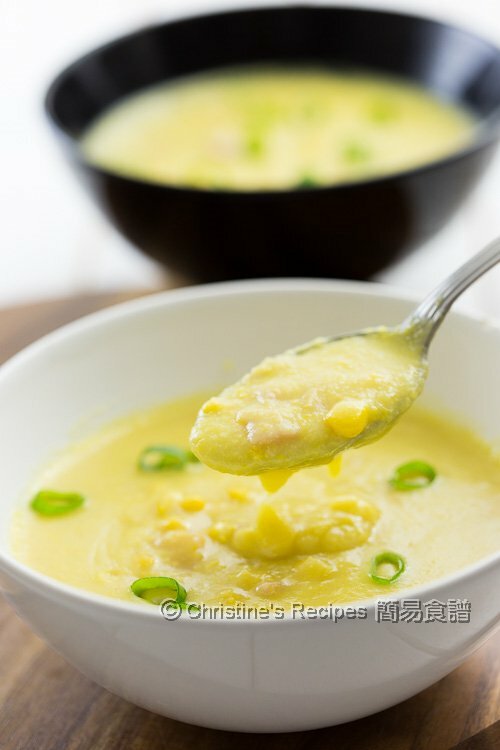 Organic fresh corns are the best for making this soup. Don’t discard the cobs. You can use them to make tea or soup. It’s very nutritious and can help remove the body heat. Creamy yet crunchy...sounds like a perfectly comforting and delicious soup, Christine. Delicious. My grandmother use to prepare this lovely soup. With tarragon is amazing. Great to have your grandmother making this soup for you, Cindy. hi, can i replace whipping cream with low fat milk? If you don't mind your soup is not as creamy as expected, why not? Hi Christine? How to make tea or soup with the balance cob?